It’s clementine season! If you’re like me, and have a few too many of those tiny oranges sitting on your kitchen counter, this shake is a delicious way to polish them off. Originally, this shake was created for my son. I like to give him a smoothie daily, and they usually contain some sort of fruit, greens, and a healthy source of fat. I knew he wasn’t the biggest fan of oranges, so I added a fresh date to the mix to help sweeten up their slightly tart flavor, added some avocado for creaminess, and threw in a handful of spinach, for good measure. This combination was a total hit– not just with my son, but with my husband, too. In fact, it was Austin who said this drink reminded him of an Orange Julius. Later, he asked me to make this shake again, but this time as a dessert. So, I omitted the greens and added a dash of vanilla to mimic vanilla ice cream. I think the result is delicious enough to share, so I hope you enjoy it, too! *If your dates aren’t soft, soak them in warm water for 10 minutes and then drain before using. Combine all of the ingredients in a high-speed blender, and blend until completely smooth. Adjust the flavor to taste, if necessary, and serve immediately. Note: If you don’t have a high-speed blender, I’d recommend blending the first five ingredients until they are completely broken down and smooth, then adding the ice and blending again for a slushy texture. 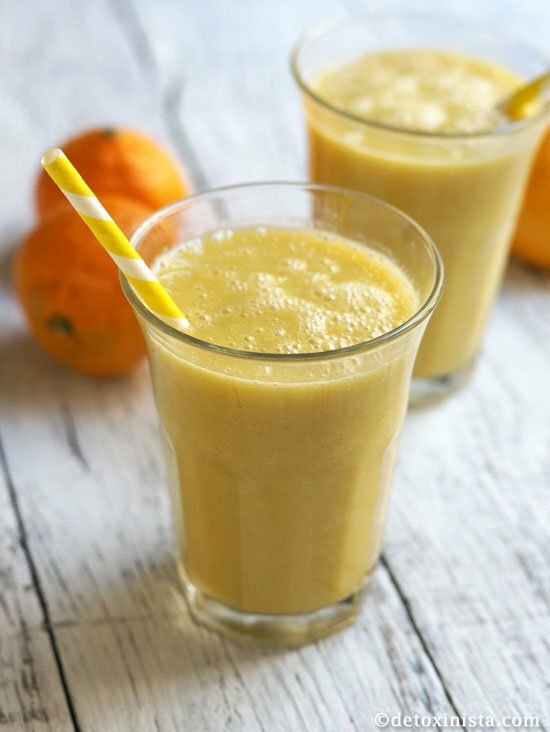 A creamy, orange-flavored smoothie that is dairy-free and naturally sweetened with fruit! *If your dates aren't soft, soak them in warm water for 10 minutes and then drain before using. 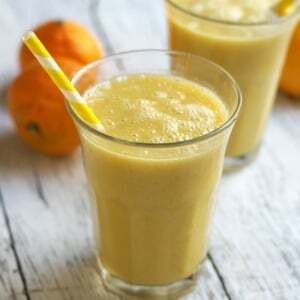 If you don't have a high-speed blender, I'd recommend blending the first five ingredients until they are completely broken down and smooth, then adding the ice and blending again for a slushy texture. If you’re looking for more smoothie recipes, my friend Tess, a.k.a. 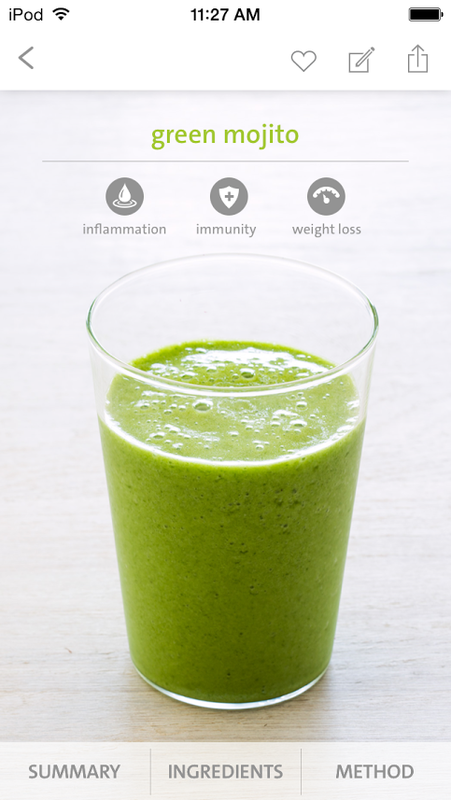 “The Blender Girl,” just released the Blender Girl Smoothies app in the iTunes store! It features 70 delicious recipes, with a new recipe added each week, along with special dietary and nutritional information, and a unique search function that allows you to search by ingredient, dietary needs, or even by your mood. With smoothies like Tastes-like-ice-cream kale, Hangover helper, and Brownie Batter, Tess’s smoothie recipes are a must-have! Smoothie App photo by Erin Kunkel from The Blender Girl Smoothies app © Tess Masters, copyright (c) 2014. Published by Ten Speed Press, an imprint of Random House LLC. I had to use oranges because that is what I had, and a few drops of toffee stevia because the oranges weren’t that sweet. Still, this shake turned out delicious. My whole family and I LOVE this smoothie. I add half a banana and its even better! My toddler doesn’t mind some Swiss chard/spinach thrown in there, either. Sooo good. Thank you. are you GF or Paleo? I just tried it and it’s full of clementines peels. Does it mean that my blender is not powerful enough? I think I will try it again but I will painstakingly remove all the peel on each segment next time. Oh yum! I haven’t had an orange julius in years! I have to try this! I was just looking up recipes for something to do with my bowl full of clementines that have been sitting on the counter- when I got your post in my inbox. Perfect! Can’t wait to try it. Thank you! This sounds fantastic! Thank you, Megan! This looks really yummy, I love clementines! Thanks for the recipe.